When it comes to kitchen sinks, it would be a terrible idea to go for the cheaper products and try to save some bucks. While there’s no denying that you can find fairly durable and functional kitchen sinks in a low-to-medium price range (in fact we have reviewed many of them too), they certainly can’t match the quality and features you get with something like the 911 Double Offset Apron kitchen sink – a sink that manages to be extraordinary on pretty much every front. And mind you, despite the relatively higher price tag of this sink, you’re getting a great deal. We read a customer review where the customer said that their contractor was surprised they didn’t pay thousands of dollars for this. That speaks volumes about the kind of value you get with the 911 Double Offset Apron kitchen sink. So without further ado, let’s walk you through the most important features of this sink you would want to know about before deciding to hit that Buy Now button. The Design and Looks Will Blow You Away! We know you wouldn’t expect anything mediocre at this price, but we are still sure that you would be so surprised at how it looks in real that a smile will spread across your face before you know it. Honestly speaking the pictures don’t seem to be doing much justice to the beauty of the 911 Double Apron kitchen sink. It has a very antique and vintage feel to it, and guests that end up giving your kitchen a visit may probably wonder if you won this thing at an auction or something. There’s the bold and beautiful design at the front that gives it a very vintage look, while the manufacturer claims it comes in a “living” finish that helps the copper wear an “old-world” look. Then there’s also the handcrafted hammered finish which further enhances the overall look of the sink and makes it a point of attraction in your kitchen. That said, despite the design and looks leaving nothing to be desired, the design is actually also very practical. It makes for a great cleaning place and the two differently-sized segments of the sink pave the way for a convenient cleaning experience. While copper sinks certainly have an upper hand against their steel counterparts, they do have some functionality issues as well. One of the most common and annoying issues with them is the constant noise you get when using them, which is only natural given they are made of copper. However, the 911 Double Offset kitchen sink boasts quite a bit of innovation, and MR Direct (the manufacturer) made sure they took care of this issue too. It comes with sound-dampening pads that are attached to the bottom of the sink, and you would be surprised at the kind of quietness you get while doing your usual washing. 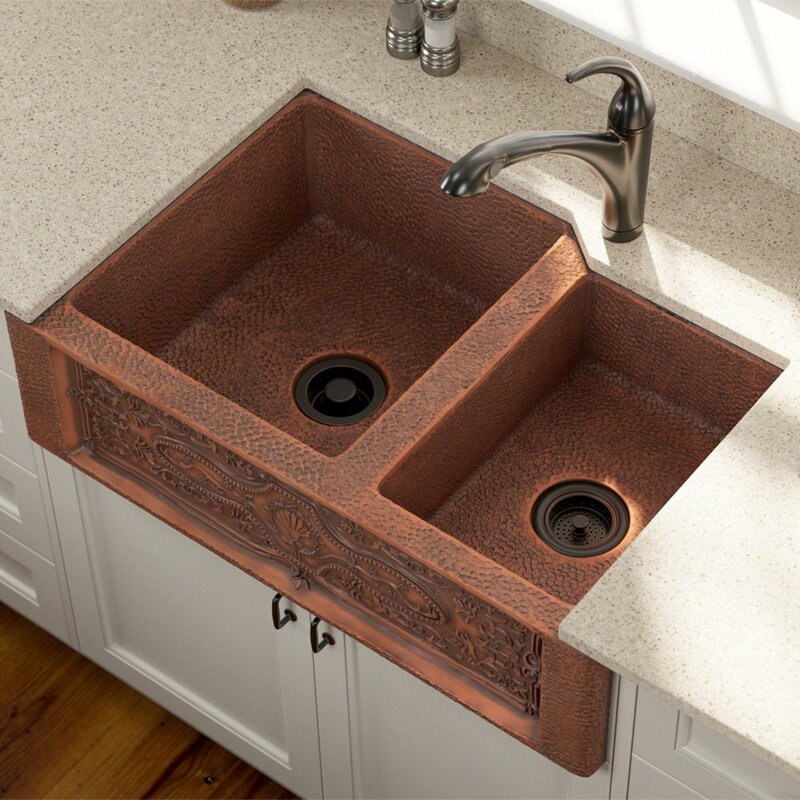 Similarly, another common issue with copper sinks that the 911 Double Offset manages to address successfully is preventing rusting and staining due to the moisture. An anti-condensation compound that’s specially made by MR Direct is applied to the exterior of this sink, which prevents the moisture from affecting the surface in any way, shape or form. And this is precisely why MR Direct proudly claims that they guarantee the 911 Double Offset won’t end up getting rusted or stained over time like the copper sinks out there. Finally, while the hammered finish helps make the 911 Double Offset all the more beautiful, it also adds to the functionality of the sink by masking the few scratches it may get over a long time. While this is usually a given with copper sinks, 911 Double Offset does manage to take it to a whole new level. 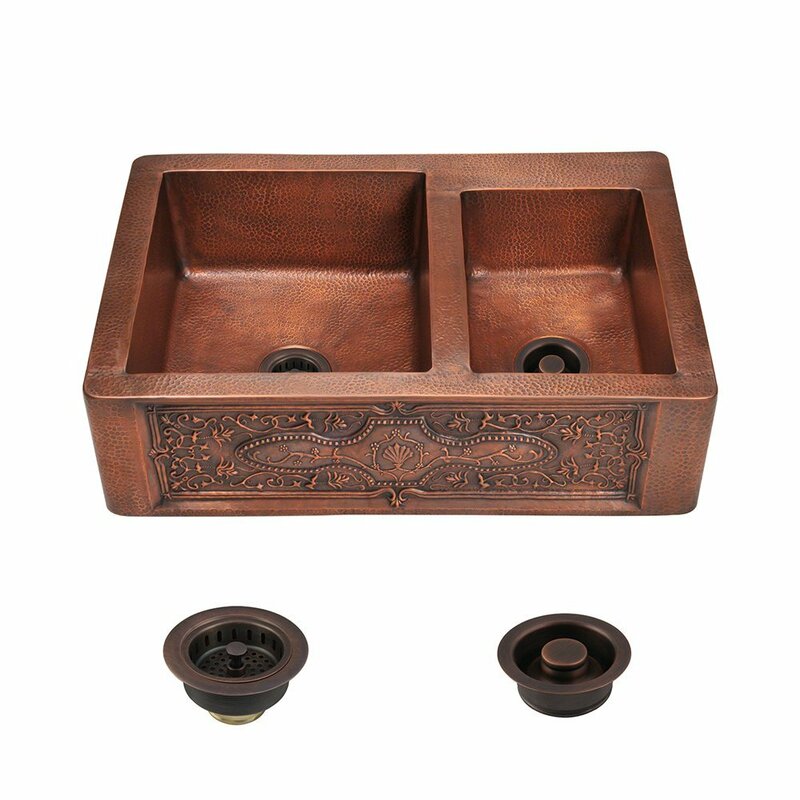 Its one-piece construction ensures a level of sturdiness that’s far superior to what you may get with many of the other copper sinks on the market. The sink itself is made of 99% pure copper, and there’s no doubting the durability and strength of copper. No matter how large or heavy the things you throw into the sink, or how hard you bang them into it, it’s going to take them all as if they were made of rubber. And no, we are not even exaggerating. After all, there’s a reason MR Direct is offering a lifetime warranty for the sink.